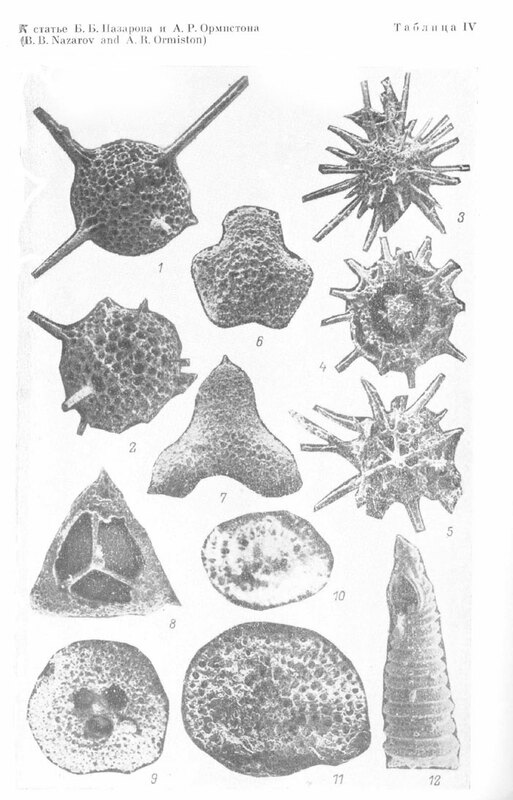 1 – Inanigutta complanata (Nazarov), x115; 2 – Inanigutta unica (Nazarov), x110; 3, 4 – Inanihella tarangulica sp. nov. (3 – x90, 4 – x95); 5 – Secuicollacta cassa gen et sp. nov., x175; 6 – Tormentum protei Nazarov et Ormiston, x95; 7 – Latentidiota trigimena sp. nov., x97; 8 – Latentidiota visenda Nazarov et Ormiston, x95; 9 – Tormentum pervagatum Nazarov et Ormiston, x140; 10 – Rectotormentum sp., x190; 11 – Rectotormentum fornicatum Nazarov et Ormiston, x190; 12 – Arrectoalatus cernuus Nazarov et Ormiston, x115. Figs. 1,2 – Mid Ordovician, Eastern Kasakhstan, Chagan River. Figs. 3-5 – Silurian, Southern Urals, Tarangul River. Figs. 6-9, 12 – Late Carboniferous, Southern Urals, Ural River, Nikolsky Village. Fig. 10 – Early Permian, Southern Urals, Sakmara River, Verkhaya Chernaya Rechka Village. Fig. 11 – Early Permian, Southern Urals, Ural River, Donskoe Village.